Prevalent vertebral fractures identified on vertebral fracture assessment images in routine clinical practice were strongly associated with incident fractures. The detection of prevalent vertebral fractures using vertebral fracture assessment imaging was linked to identification of subsequent incident fractures, according to study results published in Bone. Researchers conducted an imaging study of 9972 patients who underwent vertebral fracture assessment imaging and were assessed for the detection of vertebral fractures by clinicians who analyzed the scans. Identified fractures were recorded in a provincial health administrative database, which manages patient data for the entire public healthcare system. The investigators then completed a quantitative analysis of the data to ascertain links between prevalent vertebral fractures and subsequent incident fractures. After statistical analysis, the researchers found that patients with conclusive prevalent vertebral fractures had greater hazard ratios (HRs) for clinical vertebral fracture (HR, 2.68; 95% CI, 1.69-4.23), non-vertebral (HR, 1.99; 95% CI, 1.68-2.35), and incident hip (HR, 1.95, 95% CI, 1.45-2.62), compared with patients with no prevalent vertebral fractures. The associations were adjusted for various factors, including body mass index, age, bone mineral density, smoking, prior fracture, and others. The primary limitation of the study was the lack of a standardized review protocol to confirm the accuracy of scan interpretation. 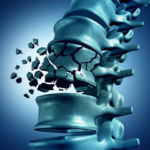 “Vertebral fractures identified on bone density vertebral fracture assessment images in clinical practice predict incident hip, non-vertebral, major osteoporotic, and clinical vertebral fractures,” the researchers wrote. “These findings are strong evidence supporting the targeted use of densitometric vertebral fracture assessment imaging among post-menopausal women and older men referred for bone densitometry,” they concluded. Schousboe JT, Lix LM, Morin SN, et al. Prevalent vertebral fracture on bone density lateral spine (VFA) images in routine clinical practice predict incident fractures. Bone. 2019;121:72-79.